Sergio Sarta Books, The coral reefs of Papua New Guinea and Portfolio. In 1997, to mark the International Year of the Coral Reef, the European Union commissioned a book on the coral reefs of Papua New Guinea. As a photographer who has spent much time in PNG over the past 10 years and has made over 500 dives in its most interesting areas, Sergio Sarta was invited to collaborate on the book with Bob and Dinah Halstead, the legendary Australian photographers who were the first to discover and appreciate the seas of PNG from the point of view of underwater photography. The European Union – funded Islands Region Environmental and Community Development Program (IRECDP) published this book as a means of promoting environmental awareness among, above all, the people of Papua New Guinea. PNG's coral reefs are areas of outstanding beauty and are home to innumerable marine species, several of which have as yet only been sighted in these seas and whose photographs are published here for the first time. In 1996, Sergio Sarta brought out a book of underwater photographs entitled PORTFOLIO, which won first prize at the International Festival of Underwater Images at Antibes, in France. This 250- page book, which met with great acclaim from both the critics and the public, is written in Italian and English and contains about 250 magnificent photographs. 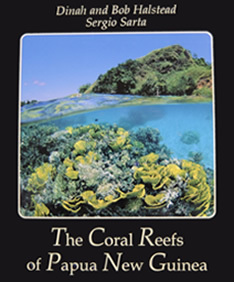 The book is organized by subject into 20 chapters, some dealing with a particular species of sea creature, such as dolphins, scorpionfish, anemonefish or corals; others portraying life underwater in distinctive locations, such as the open sea, the reef or wrecks; and yet others grouping Sarta's impressions in a more general way, such as those on close-ups, fresh water diving, night diving or models. Each chapter of about 10 photographs is introduced by a chattily informative paragraph written from the personal perspective of the photographer himself. Each photograph is accompanied by a brief comment and the location of the shot. A map at the end of the book illustrates all the dive sites, from the Pacific to the Atlantic, from the Mediterranean to the Caribbean. "As one who has been in the " diving business" for over 20 years, during which time I've escorted many photographers from all over the world, I have to admit the book is truly amazing. Such beautiful photos from the perspective of a person for whom the sea and the life in it flow through his veins." Nir Avni, General Manager of Dolphin Reef, Eilat, Israel Nir Avni, General Manager of Dolphin Reef, Eilat, Israel. "Portfolio represents the major work of one of underwater photography's finest artists, Sergio Sarta." Ocean Realm magazine. "The book is truly magnificent and it will occupy a place of honor on my coffee table at home. Again, thank you. Peter Hughes, President of Peter Hughes Diving Inc. 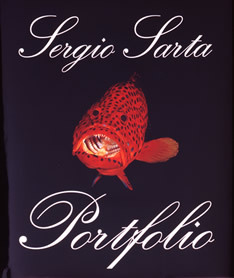 Tropical Fish (The World's Most Widely Read Aquarium Monthly ) in its January 1997 issue featured an article by Dr. Herbert R. Axelrod, founder and chairman of the magazine, on Sergio Sarta, including a selection of photographs. In the title of the article, Dr. Axelrod defines Sarta as "Probably the World's Finest Underwater Photographer".